Yellow Vest Popular Referendums: Direct Democracy or a Euro Threat? Yellow vests, a disparate group of ordinary French citizens who begun protesting against a now-scrapped hike in fuel taxes back in November, returned to the streets of Paris on Saturday for the third month running with 14,000 protesting against flash-ball riot control guns which are banned in much of Europe. Only 4,000 showed up in Paris on the 26th of January according to official figures. This week there were 5,000 in just Valence, according to AFP, with thousands more in Toulouse and other French cities. Macron has tried to calm the situation by opening a national debate. That apparently has led to an increase in his popularity to 35% from a rock-bottom of not far off from 20%, but the protests keep continuing every week. Resolving the situation is a difficult matter, but leadership figures are beginning to rise in this grassroots movement with all of them united under a key demand of the Ralliement d’Initiative Citoyenne (Citizen Initiative Rally). Interestingly, the European Union has a Citizen’s Initiative, but of a different sort from that contemplated by the yellow ones. Some 700,000 EU citizens have to sign a proposal that will buy the organizers a table chat with the European Commission which will then look at it and may or may not do something about it. While what the French protesters have in mind is a signature threshold for a law proposed by any citizen, with that law then automatically progressing to a binding referendum Swiss democracy style. A Euro Referendum in France? Direct democracy can be sound if it is coupled with a jury-style people’s parliament of randomly selected citizens that acts as a debating chamber for the signature passing laws. Is this an attempt, however, by potential nationalists to channel general discontent towards the EU and perhaps the euro with the aim of taking France out of the union? So said a statement by one yellow vests group led by Ingrid Levavasseur, an unemployed nursing assistant from Normandy who has organized the filing of ten candidates for European elections. Campaign chief Hayk Shahinyan and candidate Marc Doyer withdrew within days from this group’s attempt to become a political force through the electoral system, claiming doubts over their abilities to prepare for the vote. While another perhaps more famous yellow vests leader, Eric Drouet, a truck driver who was one of the first to call for a day of mobilization on November 17 against soaring fuel prices, has in effect rejected the electoral system, calling instead for yellow vesters to just enter Elysee according to French media. So making it very difficult to ascertain whether overall there might be a eurosceptic bent in the yellow vests, or whether it was just an off-shoots group that happens to be eurosceptic. Regardless of whether the yellow vests are in general eurosceptic or otherwise, popular referendums could potentially be gamed with Brexit perhaps being a recent example. No one quite thought the Brits would actually vote to leave the European Union until a perfect storm of a million Syrian refugees followed the biggest euro crises in its short history due to the bankruptcy of Greece. Those troubles surrounding the euro opened a temporary opportunity for eurosceptics in Britain to attack it and decisively so as it happened. Hence the dilemma, not just for France but for democracy in general. The seizing of short term crisis for long term structural decisions that may make sense while the crisis is unfolding, but might not in slightly calmer times. As history has shown, democracy clearly has a weakness in allowing charismatic leaders to rile up the masses towards, at times, pretty horrific decisions. So while popular referendums might make sense for neutral Switzerland, for a core member like France they may risk an escalation of potential crisis, crisis which perhaps should be expected for a still very young euro currency. One recent crises for the European Union could have been Brexit, but so far that has only led to a political crisis in the United Kingdom as support for leaving the European Union has dwindled across the continent in a pendulum swing. In a similar trend, polls suggest yellow vest candidates would only gain 13% of the votes, chipping away at Marie Le Pen’s Front Nacional. A prospect Macron would probably welcome. 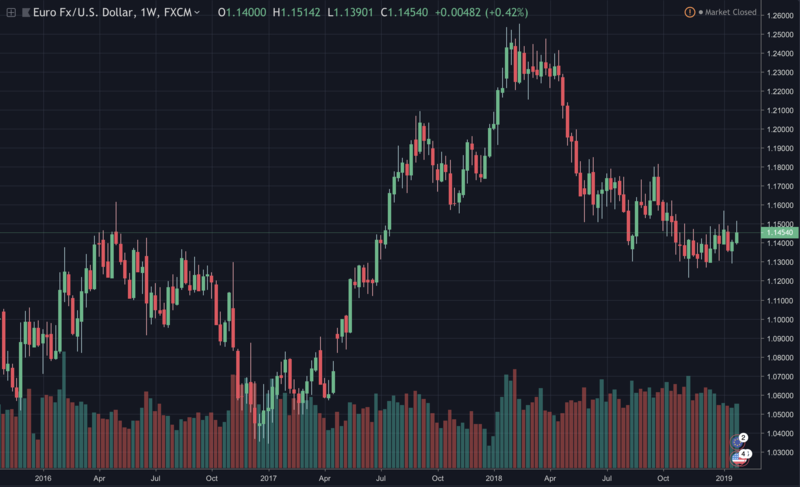 The euro therefore has strengthened considerably recently as it manages to withstand some of the greatest tests of its unity. That could change if France does move to popular referendums at the national level, rather than at EU level, as the French did previously vote down a treaty for further integration until they were asked to think again. That should have been a wake up call for the European establishment because if further powers are to be given to the EU, then the people should have more say at the EU level. Macron and Merkel recently signed the Treaty of Aachen which aims towards greater European integration and even an EU army. The disturbances in France, therefore, can perhaps be seen at a fundamental level as a citizens’ demand for more say and more power over European institutions which do have a very significant democratic deficit. If they are to give up national sovereignty, then they probably want intra-national sovereignty, an actual EU parliament that has binding votes (rather than just advisory as it stands) and perhaps Swiss style direct democracy at the EU level. Were that to be how the yellow vest anger is channeled, then the euro might actually be strengthened rather than weakened by the uprising. Macron, however, has so far been very much on the back foot. His probable dilemma is that if he gives popular referendums, then at times of crisis they might be exploited either unintentionally by ideologues or intentionally by potential enemies from within or without. Yet one could envision a more skilled leader turning this political crisis into an opportunity by forming a sense of European wide unity at the grassroots levels through EU binding citizens initiatives. So leaving the question of a jury style house of parliament to sit next to the elected houses, which perhaps should be tried, at least as an advisory body without any real power but that of a talking shop to begin with. It’s hard to see any reason against it. It would be a more formal focus group (to begin with depending on how it works out), so giving direct feedback to what at times can be an out of touch political elite. Whichever way, what is beyond question is that reforms are necessary especially regarding the democratic deficit of the European Union. Further material integration therefore would have to address that aspect with now being a pretty good time to do it as the tensions can be channeled towards a very optimistic new beginning in the European chapter.